Hybrid Camera Revolution: Blackmagic Production Camera 4K vs RED ONE MX - Fight's On! Blackmagic Production Camera 4K vs RED ONE MX - Fight's On! We've been waiting for this for a long time. The first images from the Blackmagic Production Camera, announced in April 2013 at NAB, are finally here! Yesterday, Blackmagic CEO, Grant Petty, posted a 10GB downloadable sample that he shot personally (if you want to see it and experiment with how it performs in the grade, you can download it here). This was a very cool thing for him to do, but the community of interest for this camera continued to clamor for images shot by a "real DP". Well today, we have those images - and the backstory is almost as interesting as the video itself. Turns out that Captain Hook (of Captain Hook LUT fame) took his test BMPC out on a music video shoot as the "B" cam to a RED MX. This camera essentially delivers Hollywood quality 4K motion pictures at an "amateur movie" price of $3995 - which is less than a 1080p Canon 5D Mark III with the 24-70 lens , $1500 less than an 8 bit 1080p Canon C100 , $8000 less than a non-RAW capable 4K Canon 1DC, $13,000 less than the 10 bit 1080p Canon C300 and $23,000 (!) less than Canon's 4K C500 . 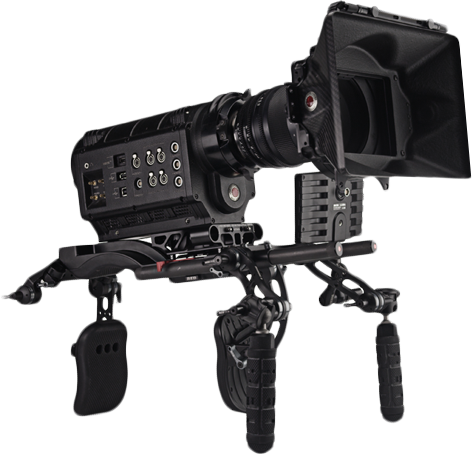 RED and Sony prices for equivalently equipped 4K cinema cameras are also at or above $10K. The new 2K Arri Amira is $20K. 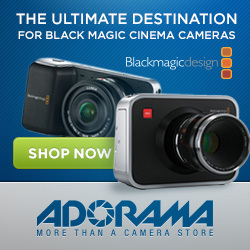 My guess is that Blackmagic will be able to sell as many Production Cameras as the factory can crank out. I also predict that we will start to see downward price adjustments from Canon and Sony - and perhaps even RED and Arri. This may be bad news for the large camera companies, but it is a terrific Christmas gift to photographers and moviemakers everywhere - even those who will never buy a Blackmagic camera. As always, if anything here has helped you to make a buying decision, please use the links embedded above or the display ads below to order. And even if you're not in the market for a cinema camera right now, please support our sponsors - Adorama, Amazon , BorrowLenses, CoolLCD, DigitalRev , uBid , Vimeo , the the Warner Brothers Shop and others whose display ads you see in the margins. It won't cost you anything extra, and it will help to keep these blog posts coming. Thanks so much! Happy New Year and thanks for the post. Just a heads up. Some of the links are broken. Thanks for the heads-up, Paul. I really appreciate it. I will go through and fix them. Happy and Prosperous New Year to you too!